For use with: any SQLBase database-driven application and Swiftpage ACT! About the User: This project was commissioned by a client who provides security solutions including guards, key holding, alarm response, mobile patrols, cameras and facility management services to a diverse range of businesses UK-wide. Project Brief: The client uses the ‘industry standard’ Roster Manager software from Logosoft to retain details of their Sites / Site Contacts and schedule workload along with Swiftpage ACT! (previously Sage ACT!) for recording day-to-day communications and e-marketing. This way of working meant significant double-entry of information with considerable inconsistency between the databases. Our brief was to provide a solution to integrate the Roster Manager SQLBase database with Swiftpage ACT! - create and update the information in Swiftpage ACT! with the information in Roster Manager. Reading information (Site, Main Contact and Alternative Contact) from Roster Manager database; NOTE THAT THE SOFTWARE COULD ‘TALK’ TO ANY SQLBASE DATABASE. Writing Company and Contact information to the Swiftpage ACT! database - if the Company or Contact does not exist, then they are created; the Contact is linked to the Company record. The solution may be run manually or scheduled to automatically update the information in Swiftpage ACT! using Windows Task Scheduler. Numerous configuration options to define the columns are shown on the User-interface grid and which fields from SQLBase are mapped to which fields in Swiftpage ACT! (amongst many other things). 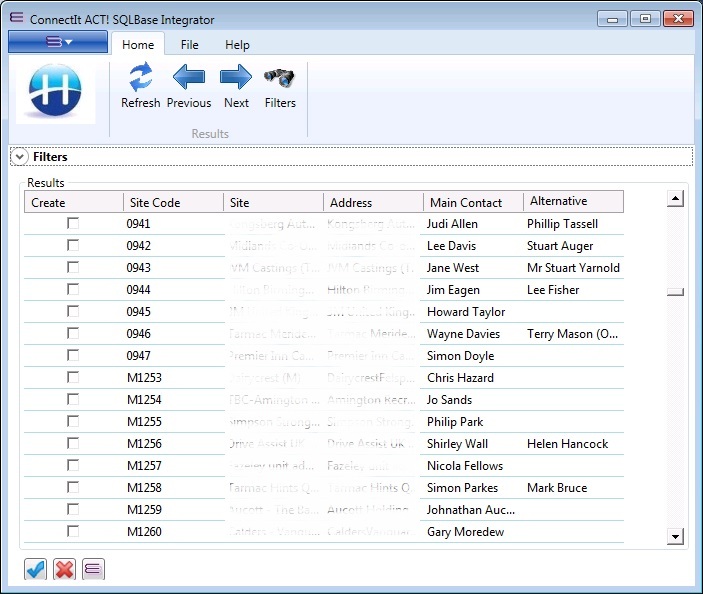 Quick, easy and accurate update of Company and Contact information in ACT! from the data in any SQLBase database.